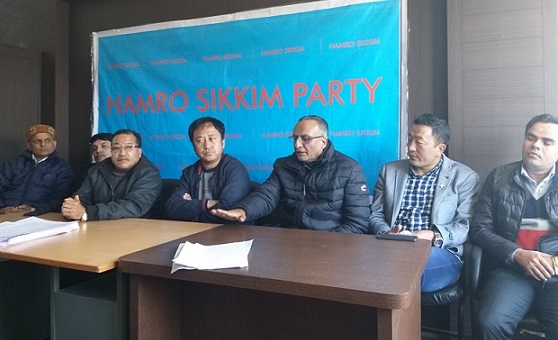 Hamro Sikkim Party (HSP]) has strongly condemned Sikkim Chief Minister’s statement that the ‘opposition parties were selling out to a Delhi buyer’ in reference to the parties’ meeting with a delegation of the BJP from Delhi. Sikkim CM Pawan Chamling’s statement was published in various newspapers on Monday. An HSP press release issued by its spokesperson Biraj Adhikari stated that buying and selling is Chamling’s speciality and he was basically saying what he thinks and does. “Even today, he boasts of superior strength in the assembly based on members which he has ‘bought’ from another opposition party. Since he is the expert on such matters, he thinks all are like him, but he is gravely mistaken,” the release mentioned. The HSP will talk and negotiate with everyone but shall never sell out on Sikkimese interests as guaranteed under article 371 F of the constitution which the Chief Minister has blatantly violated countless times for “personal gains over the last 25 years”, it added. So. instead of accusing the opposition of selling out, he should be answering to the people about the many promises he made over decades, including the sensitive social demands of the people of Sikkim, stated Adhikari. “By making such baseless accusations he (Chamling) is only trying to divert his failures in governance and now resorts to talking about other opposition parties,” said Adhikari. “He does not need to give statements on what other parties does, rather, the HSP would like to remind the Chief Minister that he needs to wake up and smell the coffee, and prepare for the investigations to come, as he already has a prima facie case of massive corruption prepared by the CBI, which he has managed to evade by misusing every democratic institution in the state,” the HSP release further said.